What does cactus such as pictured here, three middle-aged men, and to-do lists have to do with one another? A great deal, as it turns out on a Saturday in April. 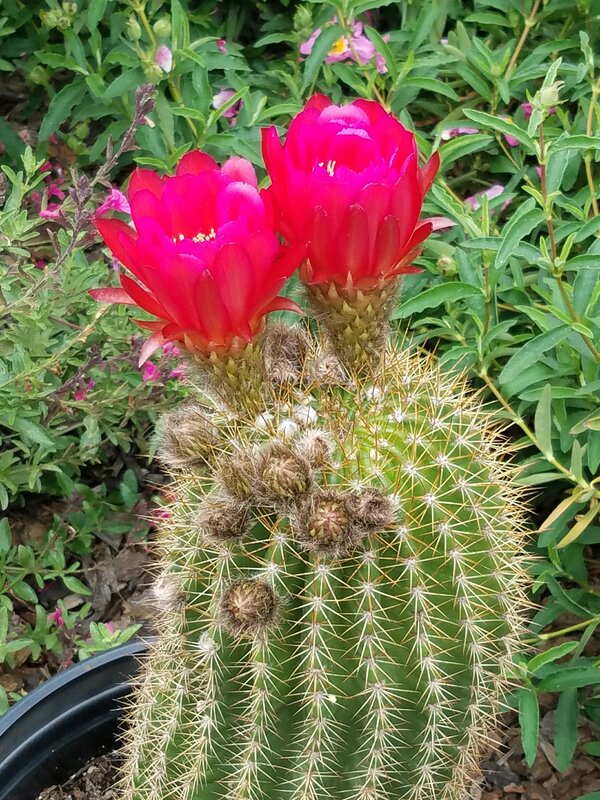 Cactus, for most of the year is a tough, resilient plant that, for a short time in Spring, displays brilliant color. While the earth puts on a colorful display, it also seems to motivate men to work in the garden or help one another with projects. This was a day for two brothers (in-Christ) to help me ( and my spouse) with a to-do list that was as much tasks as time for “male bonding”. At mid-day, I had hoped mainly for one out-of-control hedge to get trimmed and planned some weed-kill for most of the rest. The “natural look” of my front yard, as my neighbor called it, was a couple hours of trimming and hoeing later, something in picture-taking shape. This evening I am even more grateful for my other brother’s skill with drywall and carpentry, putting my “sometime this year” completion of the garage paneling done but for a sheet or two of drywall. With the beautiful weather, a reasonably- free Saturday, and two healthier-than-me friends ( with skills I do not have) having helped me today, I am now thinking about what I need to dispose in order to declutter the garage. And what is next on my to-do list. And that is probably not a bad thing. But then, what am I to do with the high-performance yard trimmer tool I just ordered online? A clean, insulated man-cave garage, with broken-in hand tools and power tools stowed in tool chests, bench cabinets, and if asked, being able to actually find them, is almost as manly as actually using them.